New students to Trent come with a wide variety of library experience and skills. Some need very little help in figuring out this new library because it's very much like the one they used at their last institution, while many have never been shown how to use a University library effectively. Most University libraries offer the same kinds of resources in the same way. What can be confusing is that the websites are all designed differently and you need to learn how a site is organized. University libraries are quite different from Secondary School libraries. For one thing, they're a lot bigger and you can't just find a shelf and browse it. You need to use the systems and search engines to find what you need. Online searching skills are required for success, and because there's so much available, understanding which databases to search for what types of material is very important. 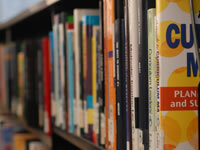 We don't use the Dewey Decimal System, so you can't navigate based on familiar call numbers. Academic libraries us the Library of Congress Classification System. It's more complex and specific. The Trent Library has a variety of options to help you find your way around. These tutorials are a must for all Trent students. Without reading these, you will certainly have a difficult time knowing where to look for the resources you need. Take an hour or so to look them over and you'll save many hours of frustration later on. Do this well in advance of your due dates, so that you have the time - don't wait until your assignment is due tomorrow! There are 3 tutorials everyone should read: TOPCAT, Keyword Searching, and Finding Articles. Then there are several more that are suggested reading. Find a link to the Library Skills Tutorials on our Library Homepage. They're always available. If you're taking a first-year course, there's a good chance that you'll be asked to complete this program. It's an online course with tutorials and one or more tests. The tests use live databases to give you practice in using resources that are important to the course you're taking it for. If you are in a course that uses the Library Skills Program, you'll be told about it by your course instructor and there will be grades attached to it. It will be listed on your course syllabus. You'll access it through the LearningSystem on myTrent. It usually takes about 3-4 hours to complete, but you can take as long as you need (up until the due date). The Library Website connects you with the resources you need for your research, and teaches you how to use those resources. Under the Help menu there's plenty of assistance. On many of the webpages there are links to pages that explain specific resources. A glossary defines terms that might be confusing. You can also use the Library Site Index to find help for a particular topic. Don't hesitate to ask us any question. There's help at the Service Desk in both the Bata and Durham Libraries. We can't do the work for you, but we'll explain the process to you and get you going in the right direction for your topic. If you have an in-depth research problem, we can schedule an appointment to sit down with you and go through it. Be sure you've already done some work yourself so that we have a starting point, and that you've read the relevant tutorials. Send us an email with your questions. The general library@trentu.ca email is at the bottom of all our webpages. We respond as quickly as we can - sometimes within the hour or certainly by the next working day. Often, we can just email you the steps you need to take and that's enough to get you going. We're also available by phone: 705-748-1011 ext. 7420 (Bata). See our hours. Durham information is on the Trent University Durham contact page. If you have a small group that would like instruction, contact library@trentu.ca to request a class. Some Library services require special expertise and help in those areas should come from the experts. Trent University Durham students should check the Trent University Durham Library webpage for information on special services and help available to them. Information on the Trent University Archives is available on the Archives website. Anyone looking for Maps, Data, or Government information should consult the MaDGIC unit.